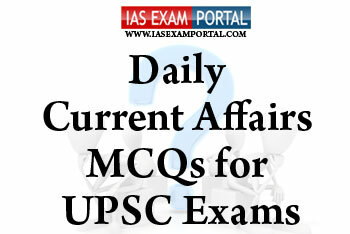 Current Affairs MCQ for UPSC Exams - 10 FEBRUARY 2019 | IAS EXAM PORTAL - India's Largest Community for UPSC Exam Aspirants. Q1. Which of the following statements regarding “Development of Particularly Vulnerable Tribal Groups (PVTGs)” scheme are true ? 1) The scheme is flexible as it enables the States to focus on areas that they consider is relevant to PVTGs and their socio-cultural environment. 2) It includes sectors such as education, housing, land distribution, land development, agricultural development, installation of non-conventional sources of energy for lighting purpose, social security or any other innovative activity meant for the comprehensive socio-economic development of PVTGs. 3) Priority is also assigned to PVTGs under the schemes of Special Central Assistance (SCA) to Tribal Sub-Scheme(TSS), Grants under Article 275(1) of the Constitution, Grants-in-aid to Voluntary Organisations working for the welfare of Schedule Tribes and Strengthening of Education among ST Girls in Low Literacy Districts. 1) Development of highly polished optical mirrors - for a solar coronographicmission :XpoSAT mission. 2) Development of large, light-weight collimators with non-cylindrical aperture for x-ray polarimetric applications : Aditya L1. 3) Providing support to research projects in wide range of topics in space technology, space science and applications to universities/ institutions. : RESPOND programme. 1) The National Strategic Plan 2017-25 for TB elimination by 2025 was developed in 2017 and included various interventions through multi-stakeholder engagement to reduce the burden of TB. 2) As per the current guidelines preventive treatment is offered only to those eligible below 6 years of age and immune compromised individuals like person living with HIV (PLHIV). 3) Govt. of India has committed to ending tuberculosis by 2030. 1) The Central Ground Water Board (CGWB) was initiated as a part of the Ground Water Management and Regulation scheme to delineate and characterize the aquifers to develop plans for ground water management. 2) The National Aquifer Mapping and Management Programme (NAQUIM)has been entrusted with the responsibilities of developing & disseminating technologies, monitoring national policies for the scientific and sustainable development and management of India’s ground water resources. 3) Aquifer maps and management plans are being regularly shared with State Governments through the State Ground Water Coordination Committees, chaired by the concerned Principal Secretaries of the respective States. Q5. Which of the following states in India has been awarded the best state in comprehensive development of tourism by the central government ?